Sony unveils its first ever phablet named the Xperia Z Ultra. And when the Japanese company says "Ultra" it means a whooping 6.4-inch screen and 2.2 GHz quad-core Snapdragon 800. That makes this device to be the first Snapdragon 800 bearer. Apart for the 6.4-inch screen realty, it also wraps a stunning 344 ppi pixel density with 1080p full HD resolution. It sports the new Sony OptiContrast and X-Reality technology which is said to be superior than the mobile BRAVIA engine. Going away with the screen, the Xperia Z Ultra sports a powerful 2GB of RAM paired with an Adreno 330 GPU. Of course, Android Jelly Bean 4.2.2 will also tap its boastful hardware on the back to make a good use of project butter and other Jelly Bean stuff. Sony, however, cut its capabilities in the camera department, this phablet only has an ample Exmor-RS 8MP shooter with no LED flash support. Design-wise, it's still carrying the same OmniBalance moniker from the Xperia Z. It's very slim in its 6.5-mm depth and it carries the familiar IP58 certification which let it stay underwater longer. Ofcourse, the 4G chip will still be in the package. However, the 3000 mAh battery would choke upon continuous LTE usage. 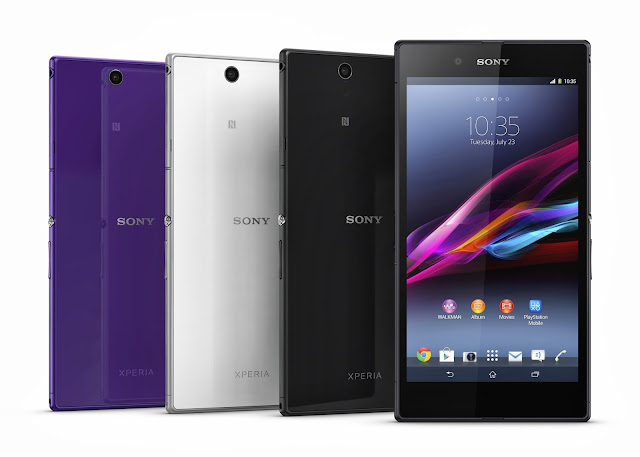 Sony's brand new phablet, Xperia Z Ultra, will be launched in the third quarter with black, white and purple hues. As usual, no pricing has been disclosed yet.